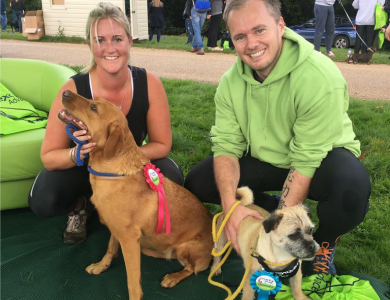 On Sunday 8th October, whilst the rest of the world was sleeping, nine adventurous Vetoquinol runners and their four legged canine friends were up bright and early to make their way to the stunning grounds of Hatfield House for the Animal Care Trust’s (ACT) Mucky Pup Fun Run obstacle course. 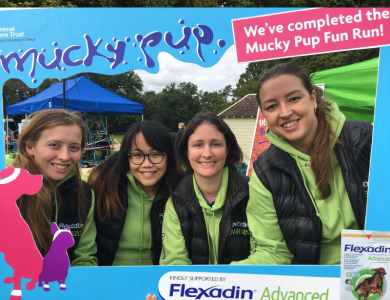 The ACT is the Royal Veterinary College's registered charity, dedicated to improving animal health and care and the Flexadin Advanced team were delighted to support the event. After being treated to a beautiful golden sunrise set up began and coats and jackets were stripped off as a surprisingly strong October sun shone over the grounds. 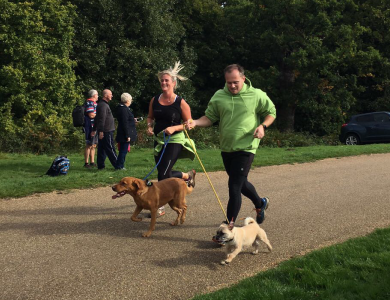 By 10.30am the starting field was full of the sounds of children, laughter and dogs barking excitedly and three hundred and seventy human participants took part in a hilarious group warm up to the sounds of the Footloose soundtrack. 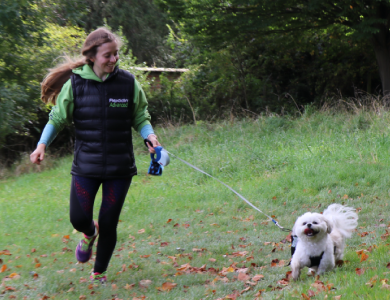 The ambitious Flexadin Advanced team set off in the fast group of runners but unfortunately Kiwi the Shih Tzu’s legs weren’t quite long enough to keep up the pace at the front of the pack! There were smiles all over the course as children and dogs scrambled under nets, jumped through tyres, and climbed over straw bales. The finish was a sea of green as hundreds of Flexadin Advanced goody bags and rosettes were handed out to the finishers and a massive selfie frame proved to be hugely popular. Territory Managers, Chris, Emily, Hannah and Sarah manned the stand, chatting to loads of owners about their dogs and wowing visitors with our virtual reality experience. This was the first time Vetoquinol have offered the experience to the public. The 3D animation transports viewers to the inside of a dog’s knee whilst educating them about UC-II®, a unique molecule which uses the dog’s natural support system to promote joint health and mobility. The team are hugely grateful to all those who helped make the event such a success and look forward to more team events in the future!